A Fall salad using a sherry orange vinaigrette, Thanksgiving turkey, seasonal vegetables and fruits. For the Brussels Sprouts- Preheat oven to 350℉. Wash, cut brussels sprouts in half placing into mixing bowl, drizzle with olive oil. Sprinkle with salt and toss well. Lay sprouts evenly on cookie sheet and bake for approximately 45 minutes. Larger brussels sprouts will take a bit longer. For the Kale- While the brussels sprouts are baking, wash and tear kale into bite size pieces, discarding of the tough center core and making sure to shake off excess water. Place kale into large mixing bowl. As soon as brussels sprouts are done baking transfer to top of kale. Cover with alundum foil and let sit for about 20 minutes. The heat from the brussels sprouts will slightly cook the kale and make it more tender for eating. For the Vinaigrette/b]- While sprouts and kale sit, measure olive into a small mixing bowl. Zest orange and add. Whisk in orange juice. Whisk in sherry vinegar and honey. Peel and crush garlic, add to vinaigrette and stir well. For the Salad- Once brussels sprouts and kale mixture has sat covered, pour vinaigrette over top of veggies. Dice turkey, add to bowl. Roughly dice red onion and dice apple leaving on skin but removing seeds, add to kale mixture. Measure cranberries and pecans, add to bowl. Toss well. 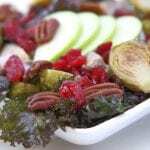 This salad can be made and dressed the day before. Tastes great cold and chicken can be substituted for turkey meat.